The Circolo San Tommaso is calling for submissions from individuals 35-years-old or less for their 2019 Veritas et Amor Contest, with two distict sections: Culture and Art. Open to degree or PhD theses and monographs focused on the thought of Thomas Aquinas, including (but not limited to) domains not strictly philosophical or theological (e.g. in human and social sciences: law, economics, political science, sociology, etc.) examined or first published not before 2015. 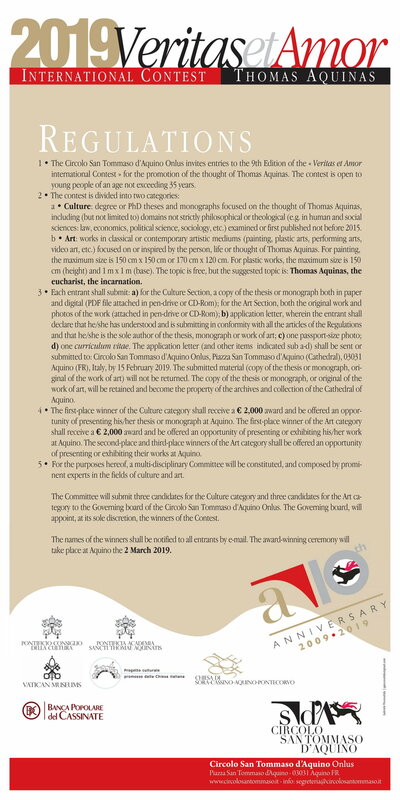 The first-place winner of the Culture category shall receive a € 2,000 award and be offered an opportunity of presenting his/her thesis or monograph at Aquino. Open to works in classical or contemporary art mediums (painting, plastic arts, performing arts, video art, etc.) focused on or inspired by the person, life or thought of Thomas Aquinas. For painting, the maximum size is 150 cm x 150 cm or 170 cm x 120 cm. For plastic works, the maximum size is 150 cm (height) and 1 m x 1 m (base). The topic is free, but the suggested topic is: Thomas Aquinas, the eucharist, the incarnation. The first-place winner of the Art category shall receive a € 2,000 award and be offered an opportunity of presenting or exhibiting his/her work at Aquino, Italy. The second-place and third-place winners of the Art category shall be offered an opportunity of presenting or exhibiting their works at Aquino, Italy. The winners will be presented in Aquino, Italy on March 2, 2019. The Circolo San Tommaso d'Aquino is inviting entries for the 5th edition of its Veritas et Amor Contest. Entrants must be 35 or under. Submissions can be in one of two forms: academic writing (theses, dissertations, monographs) or works of art (painting, sculpture, music, etc.). The deadline is February 25, 2015. For further information, including details about submitting your work, click here for a PDF of the flyer.